As I am reading this issue, I start realising that, even though there is a lot if introspection by Clarke on being Superman and by Superman on whether he is putting the city and people in danger by being Superman, this narrative approach is working in a totally different way. The artwork complements the narrative and this is most evident in the first 4 pages of Superman No. 3. There is a very irritating and frustrating reference to Action Comics current story arc (The collector of the worlds). Why is that there?! Just to show us how Superman has grown to be loved and cherished in Metropolis over the years from being a careless and reckless teenage vigilante to a more proper superbeing that helps them in times of crises but is loved and hated equally? More importantly, why am I being subjected to a recap of Action Comics and Superman in just the third issue? Nicolla Scott takes over the pencils from Jesus Merino from this issue onwards and does a bloody good job of it. Her artwork is much crisper and more suited to the writing of George Perez. 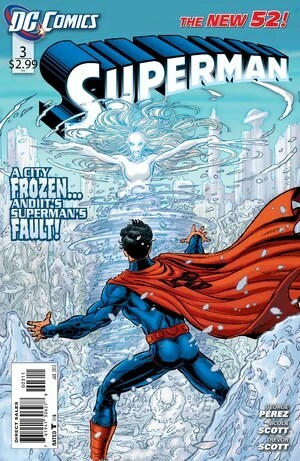 I don’t know why George bores us so much in the beginning of this issue but then the story moves at a breakneck pace with nonstop action in the last 5 pages where Superman is battling an icy loving alien who is turning everything into ice. He manages to save the day but recognises that there is a link to all the three aliens that have attacked so far and the people who have subsequently went missing following the attac (Heather, The guard and the homeless man). This series will soon fall into trouble if it doesn’t get its act together soon. Erratic quality of pace and writing, too much introspection and narration and a change of penciller. And this is just the third issue! Even though I enjoyed the flashback, it felt dragged after about 4 pages. But I must emphasize that the artwork has improved substantially and has become sharper than what Jesus gave us. Superman’s expressions are more consistent now. And so are of the others. 3/5 for this issue. Holding back the 2 because the recap and the rushed action bored me a bit.